In order to build muscle mass, you need to put your time in during your workouts, but more importantly—building a strong physique starts in the kitchen. As women, we don’t produce the same levels of testosterone men do, making it a bit more challenging for us to build muscle. The secret to gaining and retaining muscle mass lies in nutrition. Booty Building Box is passionate about providing fitness tools and nutrition that are essential to women of all ages, body types, and fitness levels to help them achieve their fitness goals. The Booty Building Box is packed to the rim with everything you need to sculpt and tone the perfect booty to go along with the rest of that amazing bod of yours. But in order to reap the benefits of all of your hard work, you need to spend some time in the kitchen. 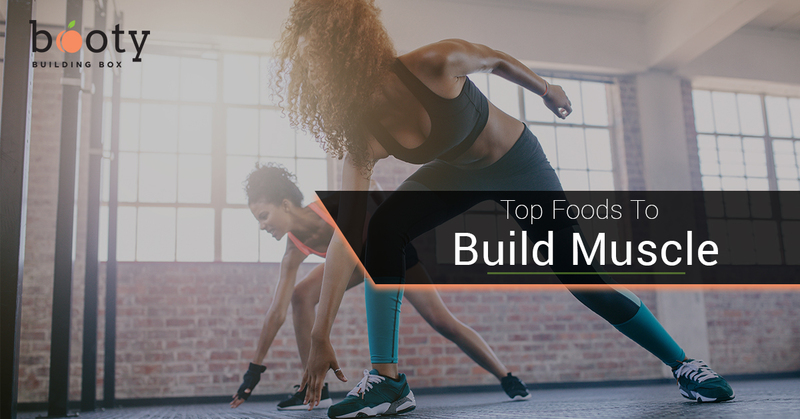 Here is a list of the best foods to help you stay on track that will get you the best results along with a solid fitness routine. Skinless Chicken Chicken is an excellent source of high quality protein and protein is essential for muscle maintenance and repair, and weight management. Fortunately, chicken is incredibly versatile and it can be prepared in many ways, so your meals won’t feel so repetitive. Note for vegans and vegetarians organic tofu and tempeh are great options as well. If you want to gain healthy muscle mass, lean beef should be a staple in your diet. Beef contains loads of zinc, iron, amino acids, B-vitamins, and of course protein that is completely conducive to your muscle growth. For people that are trying to lose weight, lean beef is a great source of fuel with minimal calories. A three ounce serving of lean beef has approximately the same amount of protein as one and a half cups of beans, but half the calories. You’ve probably seen videos of those intense bodybuilders gulping down raw eggs like its a milkshake, right? Good news—you don’t need to consume eggs that way. There is actually lot of debate over whether or not eggs are harmful to your health. We are not condoning eating raw eggs, but cooked eggs or egg whites provide the most nutritional value for your money. Eggs contain more high quality protein, essential amino acids, choline, healthy fats, and vitamin D.
If you are one of those people that has a hard time eating foods with funky textures, then you might struggle with cottage cheese. But we encourage you to overcome that battle because cottage cheese contains almost entirely pure casein protein. Casein protein is a slow-digesting protein which makes it perfect for muscle maintenance. Additionally, cottage cheese is an excellent source of calcium and vitamin B12. Consuming whey protein immediately following a workout is highly effective for muscle mass gains. Whey protein comes as a powder and can be easily mixed with water or milk for a quick protein shake. Although protein powder is a great source of protein, it is intended as a supplement and you shouldn’t rely on it entirely in hopes of quick muscle gain. The best source of protein will be from whole foods you eat throughout the day. Your body still needs fuel and energy from carbohydrates, and oatmeal is an effective source of energy but without the negative effects of consuming carbohydrates. Oatmeal is low on the glycemic index (GI) and it is minimally processed so it enhances fat loss and is a constant source of carbs for muscle preservation. Similar to oatmeal, whole grain carbohydrates like brown rice, digests more efficiently and provides more nutrients than refined grains. Additionally, whole grains and brown rice can boost your growth hormone levels and promote sustained energy levels. Also Quinoa is great for vegans and vegetarians as they hold the highest protein count for a grain. While your body builds muscle from the high-protein foods like chicken and beef, that doesn’t mean you should neglect the importance of fruits and vegetables. Eating fruit and vegetables on a regular basis is essential for healthy functioning of your immune system. Your body also requires fiber to aide in proper digestion and nutrient uptake, which fruits and vegetables are full of. Now that you have been fully educated on what to eat to build glutes fast, all you have left to do is take the Booty Building quiz, order your box of booty strength equipment, and get started! We hope you’ve found this article informative and we’re looking forward to seeing your results from the Booty Building Box!